Maha Kumbh Mela, that began at Sangam in Allahabad on the Makar Sankranti day on Monday, is expected to attract nearly 11 crore people, setting a new record for world's largest gathering. Sharat Pradhan reports from the venue of the mega 55-day festival. About 11 crore people are expected to participate in the 55-day Maha Kumbh Mela -- the single largest human gathering on earth -- that opened in Allahabad on January 14, the Makar Sankranti day. Significantly, the expected crowd was about 20 per cent higher than what the last Allahabad Maha Kumbh had witnessed in 2001, when the mega event was much shorter, just 44 days. 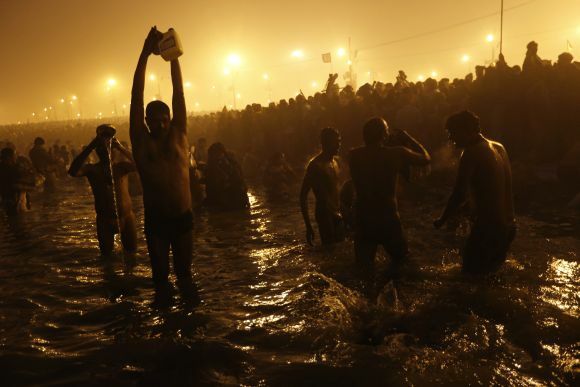 Over one crore people have converged on the opening day -- Makar Sankranti -- for a customary dip at Sangam -- the holy confluence of the Ganga, Yamuna and the mythical Saraswati rivers -- in fulfillment of their belief that the dip is the surest way to achieve 'moksha' (salvation). The bulk of remaining 10 crore would be spread over the five other key bathing days, traditionally referred to as the 'Shahi Snan' (royal bath) days, when the 'Naga' Sadhus march in endless processions to take the first dip at dawn. 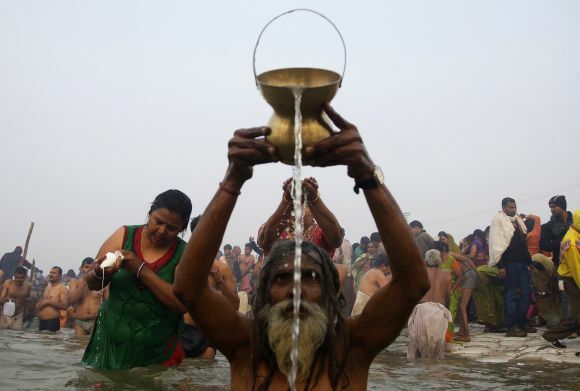 The biggest crowd, according to mela organsing committee chief M P Misra, would be witnessed on February 10 (Mauni Amavasya), when an "unprecedented 3.05 crore people" would descend along the river banks to take their dip in what they perceive as the holiest of holy waters. Basant Panchami on February 15 would draw nearly 2 crore people, followed by 1.65 crore on Magh Purnima that falls on February 25. Ironically, the smallest gathering of 55 lakh people is expected on two remaining 'Shahi Snans' -- Paush Purnima on January 27 and Maha Shivratri on March 10. The mela area, spread across a sprawling 58 sq km expanse along the sandy banks of the Ganga and Yamuna, has now turned into a gigantic tent town, officially treated as an independent district under a mela officer independent of the district magistrate. A few statistics would show the quantum of task carried out to hold the event: Nearly 156 kilometers of temporary roads have been laid down by the Public Works Department, while the Uttar Pradesh Jal Nigam has laid some 550 km of pipes to provide 80,000 kilo litres of drinking water. On the electricity front, the state power corporation has laid some 770 km of electric lines, besides setting up 73 sub stations and installing 22,000 temporary street lights. Some 40,000 temporary toilets have been built besides 3,400 Sulabh toilets. With a view to facilitating visit to the Kumbh mela, the state road transport corporation has built five temporary bus stations and would ply 3,608 additional buses to the already existing fleet of 892 buses. The government expects approximately 90,000 passengers daily to come and go between the 55-day long mela. Besides, the Indian Railways is running 750 special trains to ferry devotees to the Kumbh. Nearly one crore people, who have converged in Allahabad since the crack of dawn on Monday for a dip at the Sangam, have been driven only by their 'aastha' (faith). The common devotee may not have any fascination for the 'Naga Sadhus', who led Makar Sankranti's 'Shahi Snan' with the traditional fanfare and frolic which is a key attraction at the 12-yearly mega Hindu religious event. His interest also does not lie in the gigantic fair that is spread across a sprawling 58-sq km area. But it is his unflinching faith in the mythology, which fulfils his divine aspiration of washing away all sins with a dip at what they regard as the holiest of holy confluences on earth. 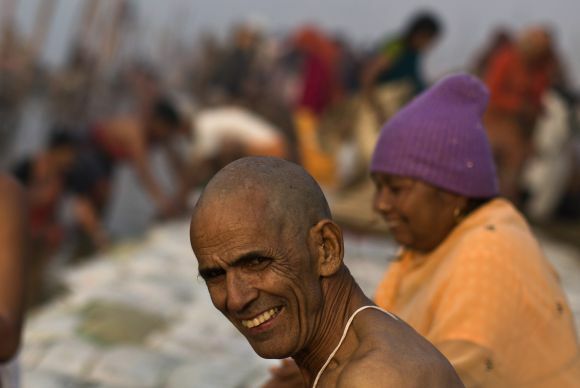 Be it Kolkata in the east, or Pune in West, Punjab or Rajasthan in the North or Andhra Pradesh and Tamil Nadu down south, Hindus from the remotest corners of the country have only one mission in coming to Kumbh -- to take a dip in the holy waters of the Sangam. They strongly believe that the configuration of stars on the auspicious Makar Sankranti day is such that the holy waters at Sangam get blessed by the heavens thereby making their bath even holier than a routine dip at the holy confluence of the Ganga, Yamuna and mythical Saraswati rivers. With the local administration having shut all vehicular movement from the previous night, lakhs of people could be seen swarming the roads -- all leading to the sandy bank which looks like a gigantic tent colony. Forty-two year old Bikas Saha from Malda at the far-eastern end in West Bengal told this scribe, "I had always longed to visit this place during the Kumbh Mela, but could not make it for one reason or the other: destiny has finally given me this opportunity to be here today so that I can be blessed by the holy waters." Bikas arrived in Allahabad with his wife, mother, brother and two teenaged sons, who are just as keen for the great event as their father. "My father told me it is going to be an experience of a lifetime and I am so excited after the dip", observed 13 year-old Swapan. Rajendra Ghate, a 31-year old shopkeeper from Pune is here with his much older sister, who is as fluent with Sanskrit as she is conversant with all Hindu rituals. The two arrived here on Sunday without any back-up for boarding or lodging. They did not mind spending the chilly night under the open skies on the vast sandy banks simply because they were looking forward to the Makar Sankranti dip at Sangam. "We had sublime faith that God will make some arrangement for us. It was He who arranged for our train ticket and if today we have been able to bathe at the holiest spot on earth it is because of God almighty," he said. Undaunted by the odds, he proposes to stay on until Mauni Amawasya on February 10, when the mela administration has predicted a convergence of more than 3 crore people for the bath. "After that, we will go back home fully blessed with renewed energy", he added. For 63-year old Hariram, who had arrived all the way from Ajmer in Rajasthan with two bus-load full of companions, it was fulfillment of a long cherished dream. 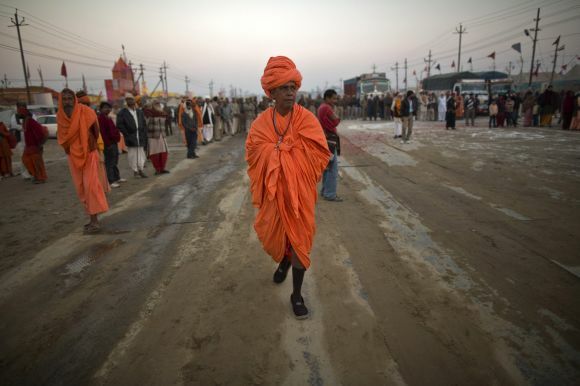 "I am really grateful to God Almighty to have brought me here for this Kumbh. 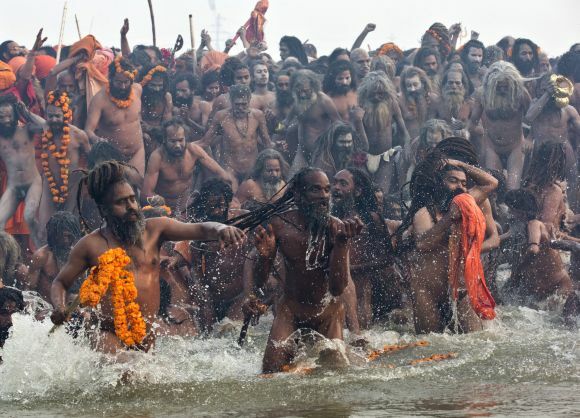 We all took a bath today -- this was our first experience of a dip at the Sangam," he said. Samsiva Rao who has come with a band of 200 people from Guntur in Andhra Pradesh is equally enthusiastic about the Makar Sankranti bath. 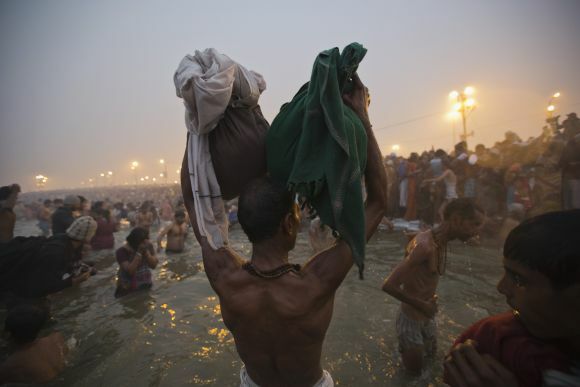 "It is the opening day of Kumbh for which I have waited for years; I feel great after the early morning dip." He says, "Having achieved the Makar Sankranti bath, we will go over to other religious places in the neighbourhood like Kashi (Varanasi) and Chitrakoot before going back home."